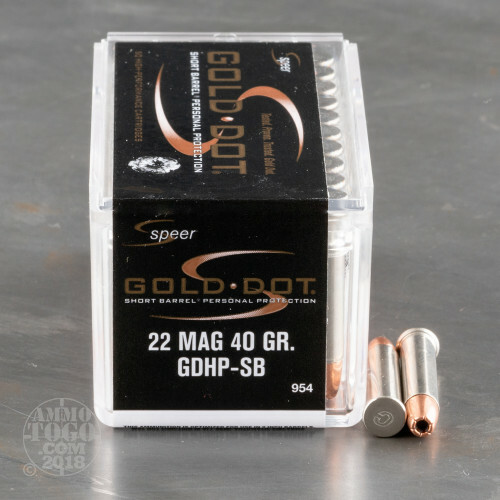 This 22 WMR cartridge from Speer’s Gold Dot line of ammunition is optimized to deliver massive results when fired from the kind of snubnosed pistol you might favor for personal protection. 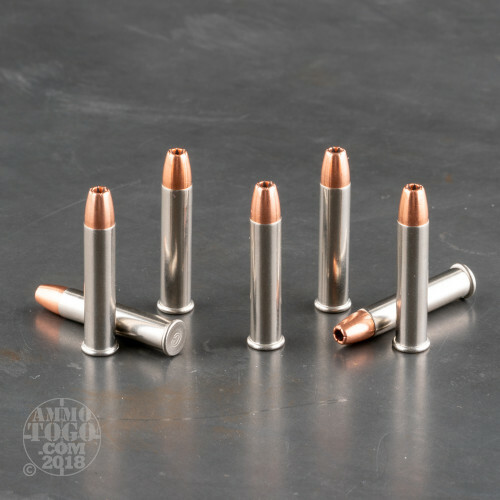 Even with the relatively lesser recoil it delivers, this round’s 40 grain projectile expands devastatingly when fired from a variety of distances, and it works as well out of a semi-automatic as it would a revolver. 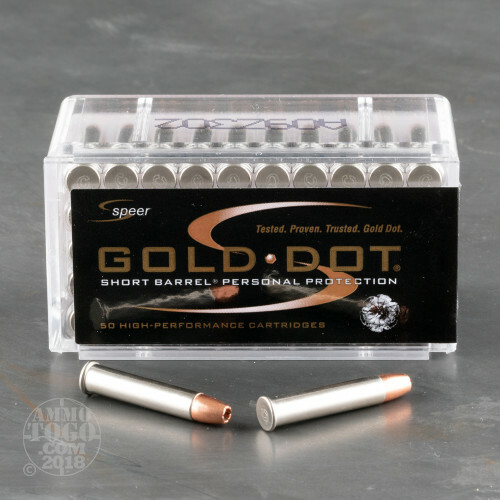 The key to this bullet’s efficacy is Speer’s proprietary Uni-Cor process, which electrochemically binds its alloyed lead core and uniform jacket together. The two become virtually inseparable as the result of this process, enabling them to retain the great majority of their combined weight as they penetrate and expand within a target. This round further features a nickel plated primer which is corrosion resistant and more visible in dark environments, CCI’s sensitive and non-corrosive rimfire primer, and propellant that creates a consistent chamber pressure and muzzle velocity. 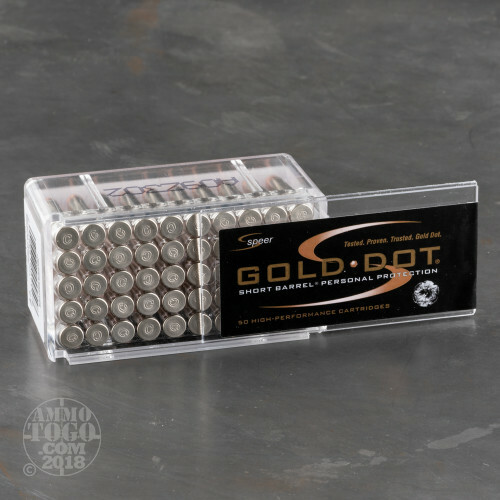 In hopes of giving ourselves and our customers a better idea how this 22 Magnum (WMR) self-defense ammo would perform if called upon in a self-defense scenario, we tested dozens of the best selling hollow points on the market. 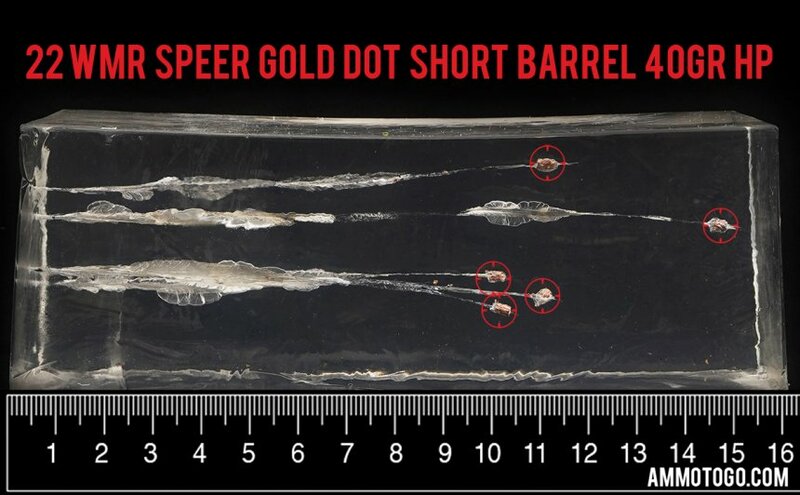 We fired five rounds of this Speer 22 Magnum (WMR) ammo through a cloth barrier into Clear Ballistics calibrated synthetic gelatin and recorded the results. For these tests, we used a Ruger LCR with a 1.87-inch barrel. In the photos, graphics and video on this page, you can see specifically how the Speer ammo performed and how it sticks up with the rest of the 22 Magnum (WMR) ammo we have tested so far. How do the results for this Speer 22 Magnum (WMR) compare to other 22 WMR (22 Magnum) ? Expansion Diameter Compared to All 22 Magnum (WMR) Ammo Tested MIN 0.22" MEDIAN 0.22" THIS AMMO 0.32" U.S. dime MAX 0.33"
Penetration Depth Compared to 22 Magnum (WMR) Tested 0" 10" 20" 30" MIN 10.2" MEDIAN 14.9" THIS AMMO 11.31" MAX 24"